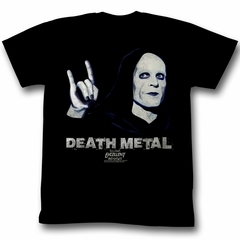 This Bill And Ted Death Metal t-shirt features a photo image of the Grim Reaper. 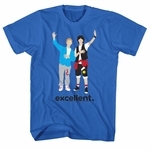 Bill & Ted is a series of two films featuring William "Bill" S. Preston Esq. and Theodore "Ted" Logan as two metalhead slackers who travel through time. 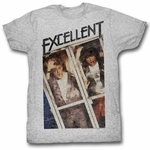 The first Bill & Ted film, Excellent Adventure, was released on February 17, 1989, followed two years later by Bogus Journey.